Aldo Nova (born Aldo Caporuscio on November 13, 1956, in Montreal, Quebec) is a Canadian guitarist, keyboardist, vocalist and producer, Nova gained fame with his self-titled debut album Aldo Nova in 1981. 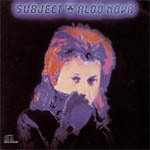 Subject... Aldo Nova is the second studio album by Canadian rock musician Aldo Nova, released in 1983. The album is in somewhat of a concept album format. It was certified Gold by the RIAA on December 5, 1994.